Femininity is not founded upon somatic prettiness or superficial materialism; it is founded upon an attitude that stems from the confidence of the beauty that blossoms from within. 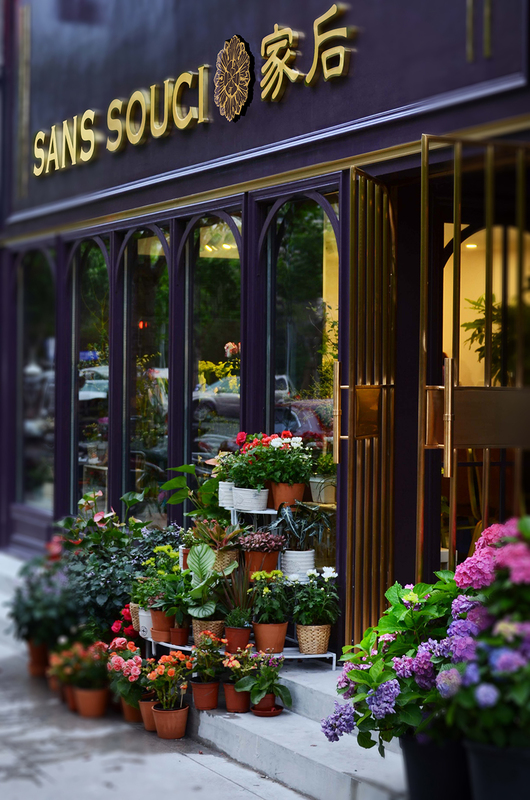 Sans Souci, meaning “without worry” or “carefree”, is a floral boutique located in Shanghai that seeks to empower the modern women of the city with feminine confidence – turning away from the false confidence of materialism towards natural and true beauty. The branding and total design of the store was designated to One Bite Design Studio. To represent the brand, the logo was chosen to be an intricate flower with layered petals, drawn in a timeless style, with a four-leaf clover at the heart for good luck. The packaging materials feature this logo in gold, and the packaging designs stray away from the traditional packaging of flowers. Combinations of interesting shapes and cutouts in the packaging showcase and present the purchases innovatively. Lastly, wishing to reflect the deeper notions of femininity, Sans Souci’s store design is bold and elegant. The exterior of the boutique is painted in a regal shade of deep purple, deliberately shunning delicate and pale tones for a colour that gives viewers a sense of stability. The storefront’s wide-spanning, arcaded windows feature clean, French-styled carved ornamentations. Similar carved ornamentations can be found on the façade, with golden highlights accentuating certain ledges for increased sophistication. Surrounded by two tiered displays of flowers, a simple golden gate leads inside and evokes the imagery of walking into a verdurous backyard garden. Inside, with exquisite displays of flowers by the windows, a row of adjoining drawer tables line the back wall with a stagger of shelves above. The drawer tables and shelves, along with the side table that lies right beside, are finished in white and golden poles vertically attached to the walls stand in front. These poles create balance, tie the wall together from bottom to top, and consolidate the visual appeal. At the center of the room and under a line of hanging lights with incongruous lampshades, a tasteful array of chairs sits around the long display table. Products such as vases, candles and teaware cover the tables and shelves, and a floor of concrete resounds with the sense of grounded stability Sans Souci hopes to translate to its customers. Through the design of this floral boutique, the image San Souci presents makes a statement that hopes to inspire confidence in women with the natural beauty found in flowers.